From past couple of days there has been immense discussion if post preference can be changed or not in SSC CGL 2016 at the time of document verification. Earlier we had shared a PGPortal Reply in which it was replied by DoPT that post preference can be changed at the time of document verification. Today we received a RTI reply (from one of our followers who wants to be anonymous) which doesn't clearly states whether post preference can be changed or not. We have also filed another PGPortal Query regarding the same and waiting for their reply, which we will post as soon as we receive it. Keep following QMaths and we'll update soon. 1. Please tell me the total number of vacancies which will be filled under ssc cgl 2016 exam till now 14 jan 2017 (Please provide department wise division of vacancies also). Please tell me the replied vacancies by ssc for this rti is final one or latest updated one. 2. What is the last date or month till the vacancies will be added to ssc cgl 2016. 3. Can we change our post preferences during document verification time, as it was done during ssc cgl 13,14 and 15. 4. what are the tentative dates for tier 3 and tier 4 (CPT & DEST). 5. what is the tentative date for final result of ssc cgl 2016. 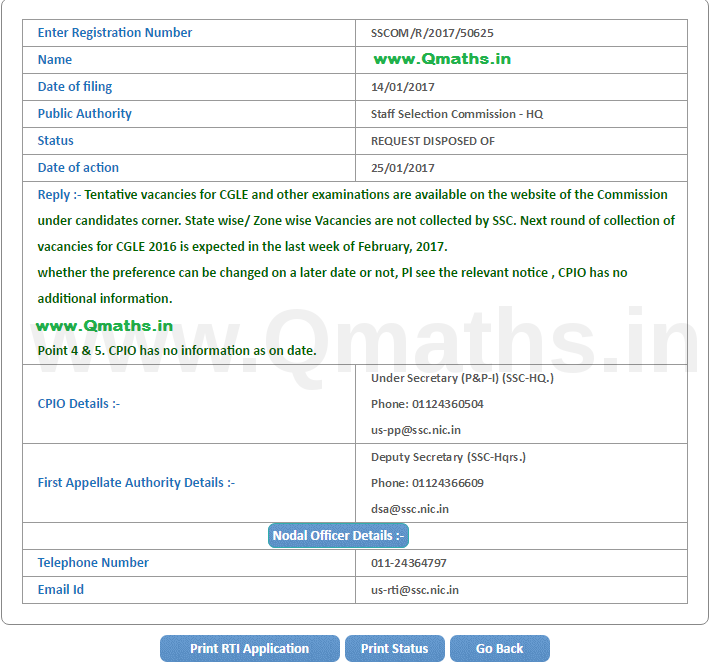 Reply :- Tentative vacancies for CGLE and other examinations are available on the website of the Commission under candidates corner. State wise/ Zone wise Vacancies are not collected by SSC. Next round of collection of vacancies for CGLE 2016 is expected in the last week of February, 2017.
whether the preference can be changed on a later date or not, Pl see the relevant notice , CPIO has no additional information. Point 4 & 5. CPIO has no information as on date.